Hi Stranger! Well it has certainly been a minute since I’ve written an actual blog post! And a ton of exciting things have happened since I last posted. 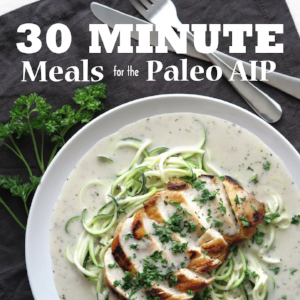 For starters, I had the amazing opportunity to participate in a community e-book called 30 Minute Meals for the Paleo AIP! 40 bloggers came together to make this cookbook happen and it’s chock-full of prep-to-table recipes that are ready in 30 minutes or less, are 100% gluten free, grain free, dairy free, refined sugar free, and nutrient dense! What does that mean?? It means that even if you don’t follow an AIP diet, you’ll be getting more than 120 recipes (over 300 if you count the sauces and goodies!) that are delicious AND nutritious! And, I’ve been busy hitting the books and finishing up a few additional certifications! I’m happy to tell you that I am now able to offer functional testing such as: food sensitivities, adrenal function, and GI analysis for bacterial overgrowth and other imbalances. I am so excited about this! While this doesn’t allow me to diagnose and treat disease, it does offer us a more big-picture way to identify and support imbalances as an adjunct to your dietary or doctor-prescribed protocol. Now that things have slowed down a bit, I do plan on blogging more….although there may be a few surprised coming up, too! In the meantime, I wanted to bring you all an update from the Unrefined Junkie! I hope you have an amazing, exciting week!